Καλός Ορίσετε στην Ελλάδα ……..or Welcome to Greece. It’s been just over a week now, since Yineka-mou and I arrived in Greece, and probably about time to start this years first blog update. 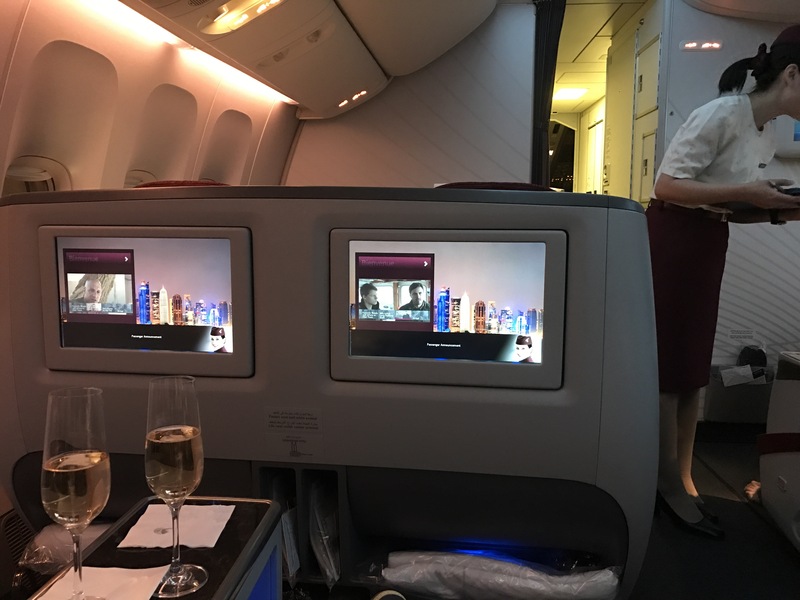 Last year, when we flew to Athens, we used Etihad Airlines for the first time, and although cheaper than either Qatar or Emirates, YM didn’t enjoy the flight so much, mainly due to the fact that they don’t supply you with pyjamas on Etihad…. can you believe it ( no probably not, it’s definitely a first-world problem). On querying this, the flight attendant told us that they only hand out PJ’s on long haul flights. ” and doesn’t this 10 hour flight from Perth to Abu Dhabi qualify as ‘Long Haul’ ” she asked. …… “No, only from Sydney to Abu Dhabi” he replied. “That’s it”, said YM to me, “we won’t be using this mob again” And that is why that last week we made the flight to Athens with Qatar Airlines once again. For the pyjamas? No, not just for the PJ’s, well at least nor for me. They only offer you two sizes to chose from, small or large. Obviously I couldn’t fit into the small size, and the large are VERY LARGE…… I could easily have fitted both of us into them, and still have room for a friend!!!! Anyway, PJ’s apart, Qatar flight schedules are just so much better, and we managed to get from our home to our apartment in Athens, door to door in other words, in only 21 hours. 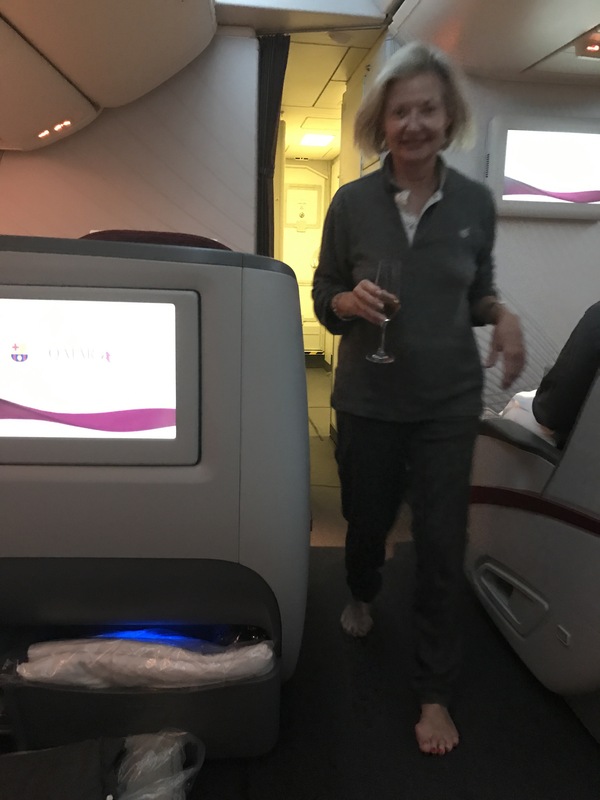 The layover in Doha was a bit rushed though, off one plane and on to the connecting flight to Greece in less than an hour….. barely enough time to get out of our pyjamas. Bloody hell, the new Doha airport is HUGE We must have walked at least 2 or 3 kilometres between the arrival gate and the departure gate. Not such a bad thing actually, I figured it has to have burned off at least half the calories I’d consumed since boarding in Perth….. OK , maybe a quarter then! In Athens I always use a company called Welcome Pickups, who for 38 Euros, prepaid, provide you with an English Speaking driver to welcome you on arrival, and drive you to your destination in a comfortable Mercedes taxi. 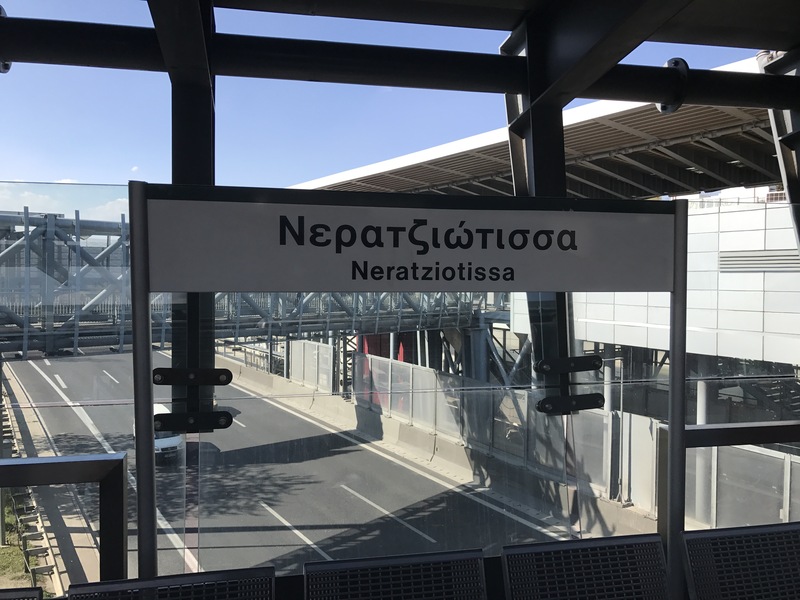 Although the price is no cheaper than it’s supposed to be if you were to queue up for a cab at the airport, in Athens this can sometimes be problematic, and not just because many cabbies cannot speak English. While my own experience is that most Greek people are very honest, generous and helpful, ( no, really) there are a few bad apples, and these apples seem to be attracted to driving taxi’s in Athens. Some of the unscrupulous ones will attempt to empty your wallet by charging you more than the flat-rate fee of €38 for ‘extras’ like the Expressway Toll, or ‘extra’ for each piece of baggage….. or using the ‘meter’ set to the midnight to dawn rate and drive you the long way into the city, especially if you are a first-timer. And yes, I do speak from experience! Anyway, our driver,Seraphim, ( an angel?) is waiting for us with his signboard right outside the arrival doors, and we are soon on our way into the city. Our landlord in Crete, Giannis, has just renovated and converted to two apartments, a family house he owns in Thiseo district of Athens, and we are to be the ‘guinea pigs’, the first people to ever stay there since the reno. He’s offered it to us at less than half price, in return for a honest review on trip advisor later. He’s been showing me photos of the place and the ( slow) progress he’s made for the last couple of years, so I know it looks good anyway. 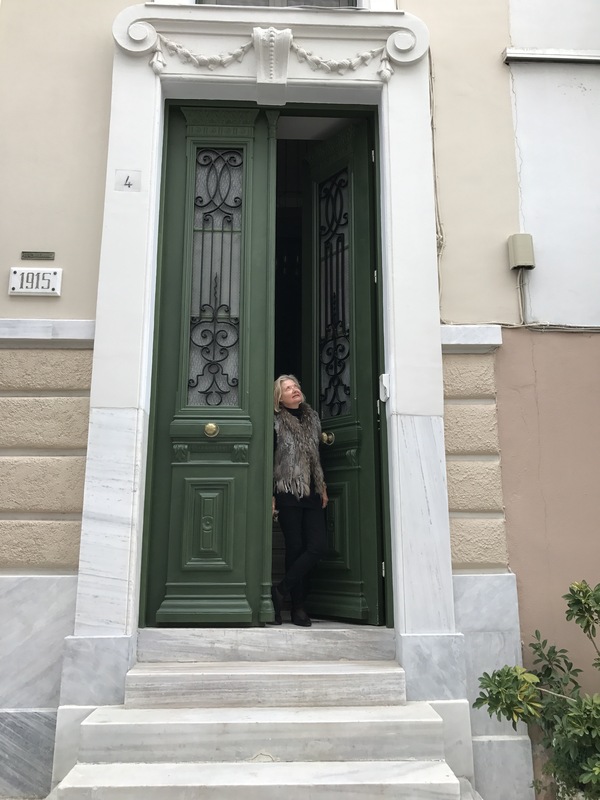 Thiseo district is also one of my favourite areas in Athens, nearby to Monastiraki and Plaka, though I’ve never stayed in Thiseo before, as there are hardly any hotels there, it being mainly residential….. sort of a Greek version of Subiaco or Toorak! But with more cafes and bars! A little bit apprehensive as to what awaits us at number 4 Odos Flamarion , we arrive at the narrow street, ( already very narrow by Oz standards, and when you factor in the cars parked on one side of the street, there is very little room left to manoeuvre our large Mercedes Taxi), unload our luggage, and ring the door bell. Thankfully, Gianni is waiting for us there, and after the usual kisses and hugs etc, he helps us up the flight of stairs to our apartment. First impressions….. Stylish…. and spacious….modern yet classical and very comfortable. Giannis is an engineer come architect, and he has done a great job of renovating and decorating this house that was built by his grandfather in the classical Athenian style back in 1914. YM is very impressed, and delighted by my choice of lodging….. Phew, what a relief ! We’d originally planned to stay just two nights in Athens, Thursday and Friday nights, but Giannis tells us that the reason he has come to Athens is not just to meet and greet us two, but to take part in the Athens Half-Marathon run on Sunday. As soon as YM hears this, she thinks it would be a great idea if we stay an extra night and participate in the 5 kilometre run…. that’s a ‘we’ participate in the run. While I’m not at all averse to the thought of staying for a Saturday night in Athens, and to watch the half-marathon on the Sunday morning, i hadn’t really planned to run any part of it myself. YM however, is madly enthusiastic at the thought of us running together thru the streets of Athens, in the footsteps of Philippedes, the fabled soldier who was the original marathon runner in 490 BC or thereabouts. At dinner that night in one of our favourite Athens restaurant, Tzitzikas & Mermigas, and after a bottle of Moschofilero wine and a few glasses of Raki, I began to believe that yes, maybe her idea has merit…. yes, absolutely, great idea YM, you’re brilliant…why hadn’t I thought of that…!!! Which is why early the next morning myself and YM were at Monastiraki Train station waiting on a train to take us out to the place where we have to register for the event, and pick up our race numbers and tee shirt etc. The way I looked at it was, for the €30 euro entrance fee, you got a nice original logo’d tee- shirt to wear, and you didn’t even need to race. How difficult could that be? Actually, more difficult than you think, and I’m not talking about the race itself, but the registration procedure. 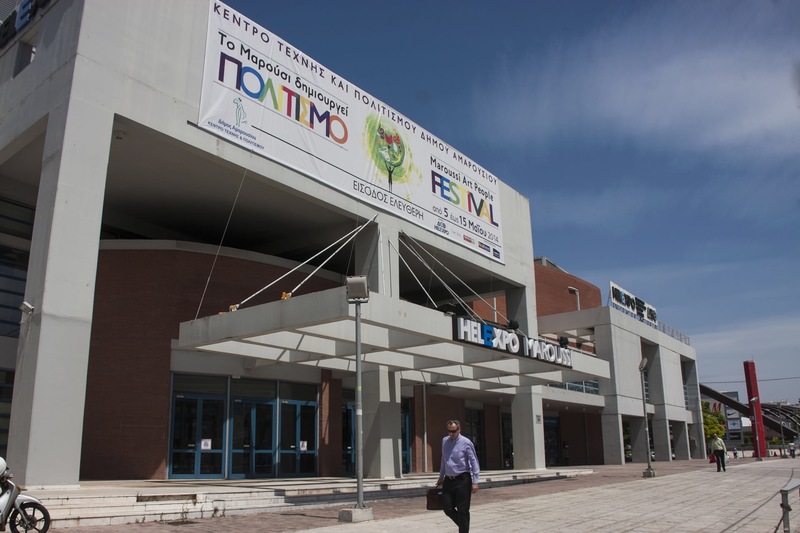 Why the hell did the organisers chose such a difficult place to get to as the aptly named Hel-expo building in the outer northern suburb of Marousi, it’s 22 kilometres away from central Athens! 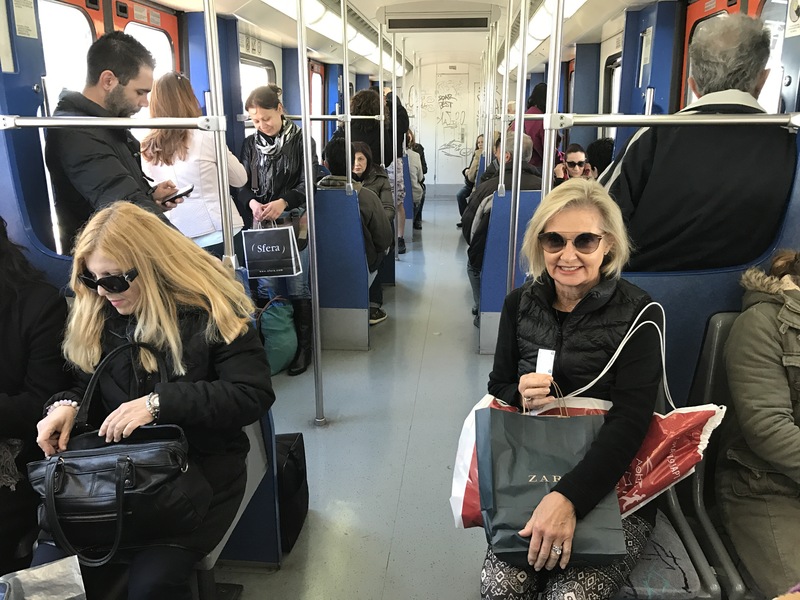 After 30 minutes on the train we disembark at the site of the 2004 Olympic Stadium, walk across the road to a huge new shopping centre, Athens Mall, and then wait there for a bus to take us another 15 minute ride away to the Hel-expo registration hall. (Hel-expo? Must be a typo? Where the hell is the other ‘L’ ) Thanks to Google Maps we eventually find the right building, and so far it’s only taken us just over an hour to get here. As there are supposedly twentytwo-thousand runners taking part in the events on Sunday, the hall is pretty crowded, some would even call it chaotic, but this is Greece and they do chaos well here. We are handed a couple of forms that we need to fill in…. in Greek….. no problem with that for me, we are in Greece and I can read Greek, (though not necessarily understand everything that I read) …. but it does mean I have to spend quite some time to fill in YM’s form as well. But why does it ask for your fathers name on the form? How do adopted orphans manage to enroll, as the answer to this question is compulsory? I guess you can always lie, as who is going to check it anyway. We hand in our completed forms to the lady at the enrolment desk, who takes a quick look at them, hands them back and tells us we must now go to the cashiers desk to pay the fee. We eventually find the Cashiers Desk ( Tamias in Greek), join the queue, and eventually hand in the forms, but not before we answer to a few more questions ( “are you Greek” he asks…. oxi, I’m Australian) and hand over my credit card to pay the €60 fee. I might as well have been waiving garlic at a Werewolf from the reaction I got. ” Mono Cash” said the Tamio ( cashier), ” Only Cash”. I should have known this, cash is king in Greece, they don’t trust the banks with their money ( with good reason) but where is the ATM, I don’t have that much cash on me. Not in this building we are told, but in a shopping centre a block away. OK, we’ll be back soon, we promise the Tamio, and set out to find the shopping centre with the ATM. Cash withdrawn, we make our way back to Hell, sorry Hel-expo, and queue up again at the cash desk. There are now three cashiers, though only one is actually doing anything, the other two are just sitting and watching the proceedings. “Ha, Australia” he says, when I hand over our forms and the cash, and the other two men then engage me in conversation. Well, as it’s in Greek, it’s mainly questions…. “Where are you from? ….” Australia “…. “Ah, Μελβουρνε” (Melbourne) he says, “I have a cousin in Melbourne” They seem slightly disappointed that not only don’t I know his cousin, I’m not even from Melbourne. YM and I are handed a receipt for the €60 we just paid and are directed to go to another stand nearby, where we show the receipt and collect our 5k race numbers. We are handed a very large bag with our numbers inside, but no tee shirt. “And our teeshirts?” I enquire. Ah yes, we have to collect them from another place, nearby….in the next hall, where there are dozens of stalls and exhibition stands set up, selling all manner of marathon and running related equipment and, using the IKEA method, forcing you to pass by every stand. At last, the final hurdle over, and clutching everything we need to participate, we head out of Hell-expo and begin the same journey in reverse to get back home to Thiseo. All in all, it was a three hour operation, but what the hel ….it’s one way to pass the time. I mean what else is there to do in Athens, visit the Acropolis? Never one to pass up a freebie, those pjs will be priceless !!! Great to see Lyn supporting the Johnson family business too.